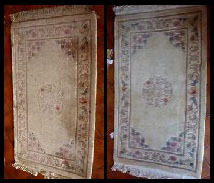 Our 8 stage oriental rug cleaning process It's better and more thorough than any other Oriental rug cleaning system. 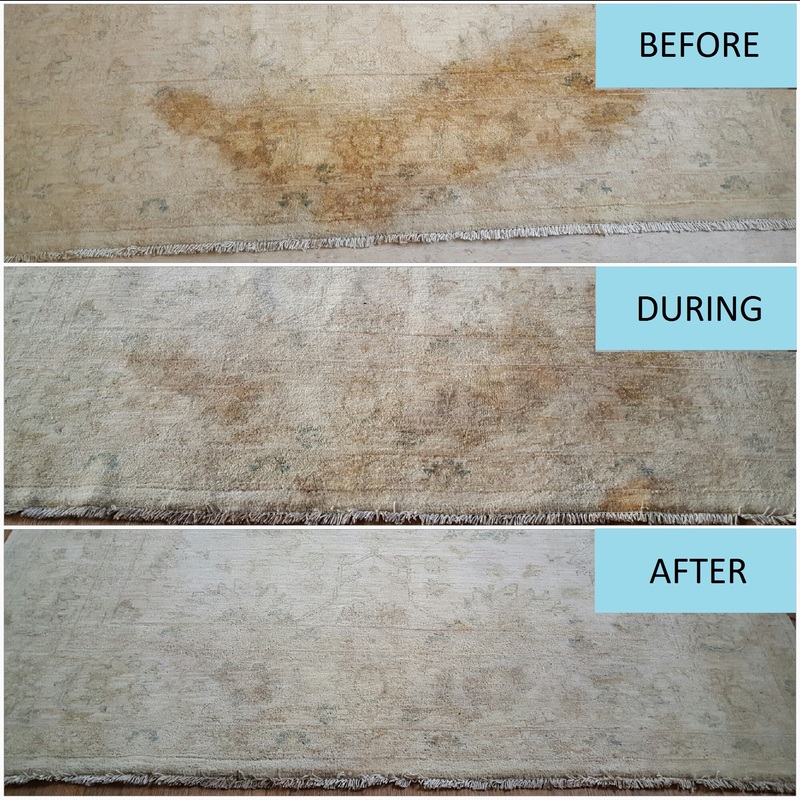 Developed by the rug restoration experts at Olney Rugs, RugRevive cleans, revives and restores the colours of your oriental rug. Deep in the pile, it can't be removed by conventional vacuuming alone. pile, it discolours the wool and is impossible to remove. come all these problems and produce great results. All cleaning is done in our own restoration workshop. Gets rid of the grit and dust and make your rugs last longer. Flushes away years of dirt stuck to the rug pile to show the true colours. Shakes out soil deep in the pile of your rug with a powerful vibro action. Uses powerful specialist rug cleaning equipment for the best result. Q. Can't I get a Carpet cleaner to give my rugs a quick clean? Q. Do you clean Chinese rugs? Q. Will the cleaning chemicals fade the colours of my rug? Q. Can you remove all the stains? A. Most spots and stains come out with normal cleaning. We use special treatments on those that remain. If the stain is still present then it's permanent I'm afraid. Q. Do the fringes come clean? A. Yes and if they are a bit battered we can repair them. Q. How do I get the rugs to you? A. Just drop your rug off at our shop at your convenience, please note our opening hours. Q. Our rug is very big. Can you collect it and return it to us? A. Yes we can. The cost depends on time and distance and also if there is furniture to move. A. Measure up your rug in centimetres and use the cost calculator below. Remember to include the fringes in the measurements. These prices are for wool pile rugs. Call us for a quote if you have a silk rug that needs cleaning. Use this Cleaning Calculator to work out the cost. Don't forget to include the fringes in your measurements. If your rug is made of silk you will need to call us on 01234 712502. For multiple rugs, enter the new rug, Calculate and then click 'Place an order' again.